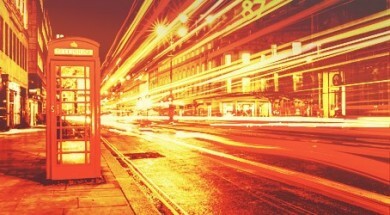 Is your content often delivered late? Do you have trouble getting it signed off? Does it typically get stuck in limbo? If you’re nodding your head, your content team probably hasn’t defined its workflow. Every content team that wants to keep its projects on track needs to define its workflow before any content creators’ pens touch paper or fingers hit keyboards. 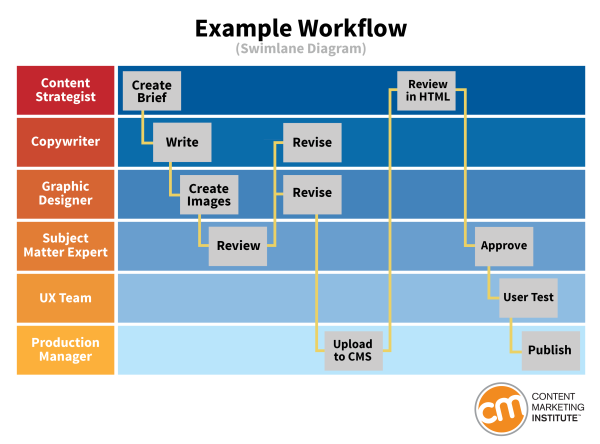 What is a content workflow? Even if you haven’t defined your workflows, your team has them. Every team does: Certain people do certain things at certain times over and over. A workflow may be simple or complex. A team may have separate workflows for certain clients or types of projects. When documented, a workflow often takes a visual form showing the progression of tasks. This example, which shows each role in a “swimlane,” conveys the progression of tasks across roles (vertically) and over time (horizontally). Why define your content workflow? If you leave your workflows undefined, it’s difficult to keep track of a large number of projects, and projects can get stuck. People on the content team may be unsure of their responsibilities or unaware of the amount of effort required to complete the content. Break down the content process into manageable tasks. Identify each piece of content’s stage of development. Identify each step for the content to receive approval. Know who is responsible for each step and when. A defined content workflow tells people in all roles where the content is in the process when their turn comes, and it clarifies what they must do to deliver what’s needed when it’s needed. The workflow also helps the project manager recognize bottlenecks so that he or she can take measures to keep content moving toward production. To define a content workflow is to identify who does what when. You can do this in any way that your team finds helpful. Use the terms that your team uses. Let’s look at each part — who, what, and when — separately. After you have identified the roles for a given workflow, identify the tasks (“create a draft” or “approve a draft,” for example), assign each task to a role, and put the tasks in order of completion. Then define each task in as much detail as needed to minimize time spent on avoidable edits, queries, and general confusion. For example, when defining the task “approve a draft,” you might spell out exactly which aspects of the content need approval. Spelling and grammar? Accuracy? Readability? Voice and tone? Compliance with certain policies or legal requirements? For any tasks that need more details than will fit in the workflow itself, point people to those details. For example, you might tell writers where to find the content’s purpose, audience, word-count goals, style guidelines (for voice, tone, and format, etc. ), and anything else they need to know. After everyone included in the workflow has been allocated their responsibilities, you have reached the place where you can define the phases that the content will pass through. “ASAP” isn’t a deadline. “Yesterday” isn’t a helpful response. As in any process, the stages of content production follow a logical, repeatable order. Those stages need clear milestones and dependencies so that the whole team can see the interrelated deadlines. With a workflow for content production on a website project, of course you start with a brief and move through production and review and then to publish. The narrative is linear and makes sense. But it isn’t always that straightforward. Introduce several feedback loops (marketing, HR, legal) and you’ve added several layers of complexity to the workflow. But now you know who is doing what, when they need to do it is the next requirement. This varies greatly on the scope of the project and how many people are involved. But several considerations are relevant to all projects. First, let people know when in the workflow they are featured. You may show this visually, get everyone into a room and talk through the workflow, or use a tool to manage this. Find what works for you but make sure this information is disseminated effectively. Pushing content through the workflow requires a shared understanding to keep things on track. For example, if you know a certain subject-matter expert is away every Thursday, don’t set the sign-off date for a Thursday as that will thwart success and set things up to be late from the beginning. This is where the understanding of people’s day jobs and related schedules can inform the assignment of work and tasks across the workflow. You also need to be realistic about when things can be done. Allocate a realistic amount of time to each stage. Using a simple 750-word page as the example, let’s say the average time it takes to get from brief to publication is 12 hours. Scale that up to a website with dozens or hundreds of pages, and it becomes evident how time-consuming content is. This is why a clear workflow can help teams keep projects on track. There is no room for excuses such as “I didn’t know it was my responsibility” or “That’s not my job” — things I’ve heard many times when working with clients. With a defined workflow, everyone who helps plan, create, and publish the content knows the process and how their individual tasks fit into it. Let’s say you’ve defined your content workflow. You’ve covered who, what, and when. This effort alone doesn’t protect you from pitfalls. The process doesn’t run itself. There will still be bottlenecks and there will still be some buck passing. That’s why you need a sole person who is responsible for overseeing the project, including keeping each piece of content moving through each stage of the workflow. This person may be a project manager, a content strategist, or a marketer. As this person will understand the workflow in terms of who is doing what and when, he or she can easily identify the bottlenecks, unblock the projects, and keep them moving. Perhaps a lot of content is with John from the legal department to approve. He hasn’t done it and the content can’t be passed onto the next stage of the workflow, which is proofreading by the editor. Knowing that John is a bottleneck means you can address the reasons why (no time, other priorities) and help unblock him. It’s not a blame game buy rather a way to identify issues that need to be addressed to keep the content (and project) moving. As with any content documents, such as content inventories and style guides, the workflow should be a living document. 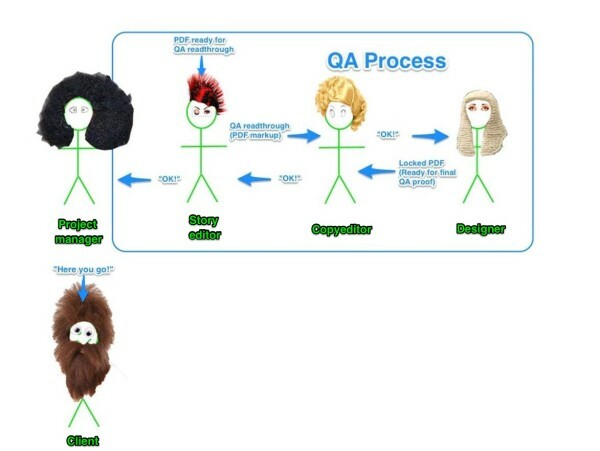 I was part of a team that was having a devil of a time getting clear about the QA part of our workflow. Everyone was confused. I finally drew these stick figures and sent this drawing out to everyone. Someone else added the wigs. Whoever said workflows can’t be fun? Online collaboration tools, like Trello, can help teams track their workflows, possibly using a built-in calendar to give a graphical view of the editorial calendar. Some teams use spreadsheets. Others use project-management software, which enables them to plug in start dates, task durations, and dependencies so that date changes ripple through automatically. Some tools enable teams to see at a glance what phase of the workflow a piece of content is in. For example, in GatherContent, each phase of the workflow may be assigned a color for a visual overview. Some content management systems enable teams to build the workflow into the system itself so that the responsible party gets notified when it’s his or her turn to take action. Tools for defining and communicating about your workflows can be basic or sophisticated. Experiment to see which tools best support your team. Identify who is involved (the roles). Identify what each role does (the tasks). Identify when the tasks get done (the flow). Then, assign someone to oversee each content project, tracking the progress through the workflow. Finally, explore ways to use software tools to communicate about the workflows and possibly even integrate the workflows into your systems. What experiences have you had with defining content workflows? What has worked well for you, and what hasn’t? Want more on developing strategies for your content? Sign up for our Content Strategy for Marketers weekly email newsletter, which features exclusive insights from CMI Chief Strategy Officer Robert Rose. If you’re like many other marketers we meet, you’ll come to look forward to his thoughts every Saturday. Robert Mills is Content Strategist for GatherContent – the pre-CMS content collaboration platform. He is also editor-in-chief of the GatherContent blog, a go-to resource on a range of content strategy topics. Rob is a journalism graduate, ex-BBC audience researcher, and former Head of Content and project manager at a branding and design agency. He also collects typewriters!